Graphics Design, Web Design and Website Creation by freelance designer Kevan Heughan of Gabriola Graphics. I take it for granted that everyone knows how to use a web browser (Firefox, Chrome, Internet Explorer, etc.) But almost certainly we all don’t use them the same way. Of course we open our web browser, visit a search engine (or maybe that’s your home page) and go looking for the content we’re interested in. Many of you might know this, but without visiting a search engine page, you can just type your search query right in your address bar and hit enter. You’ll be taken directly to the results page for your search. Woohoo! Big time saver! You don’t even need to go to Google, Bing, DuckDuckGo or whatever your favourite search engine is. The results page you are taken to when searching this way is based upon your “default” search engine in that browser. Each web browser has it’s own default engine it uses. If you want to change the default search engine your web browser uses each time you type a query into the address bar, you can. 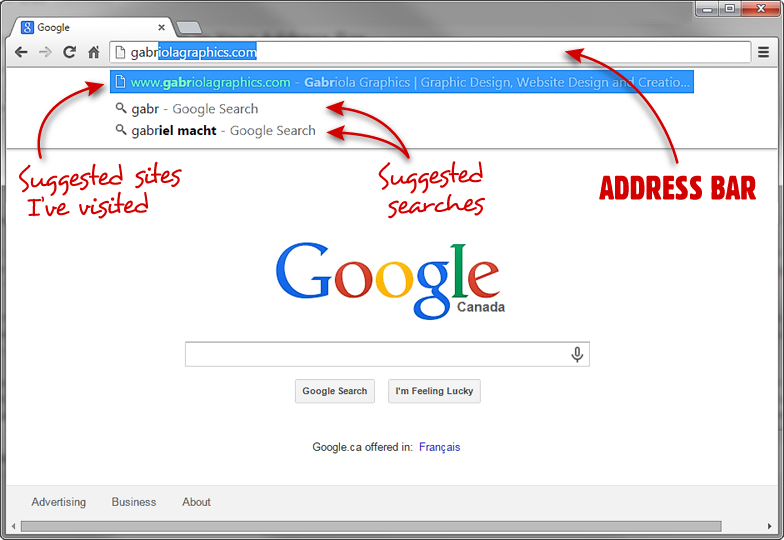 Just Google (or type directly in your address bar!) your web browser name and the words “change default search engine”. If you are typing in the address bar searching for a website you have visited before it will automatically suggest to you what you might be looking for… which you can then click, and it will save you a great deal of time typing out web addresses. For example: As I have visited my own site www.gabriolagraphics.com many times, when I type in the address bar “gabr” it suggests a choice right below my typing for the full web address. So nowadays, I type in some of the characters of a website I know I want to visit and when the site I want pops up as a choice, I simply push the down arrow key, select the site I want, and hit enter.